I don't want take a lot of time out of your busy schedules however I did want to take a moment just to catch you up on the newest pages and services that we have just added to our site, just in case you'd be interested in any of them. 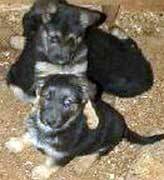 Visit the GSD related listings on this page and let us know if you like this service or not. Remember to check back often, as the dog listings below change throughout the day, and even by the hour! Have fun and good luck shopping for dog related gifts. Poisonous foods and your pets - what is good for you is not necessarily good for your pet. It is important not only that we know which foods are potentially harmful to our pets but also, why these foods are harmful. If you can do these than you are approaching the level of development already mastered by your dog. Pedigreeddogs.com announces its Grand Opening! Please visit http://www.pedigreeddogs.com and sign up your own dog related website or business now before the price goes back up. And now, during our Grand Opening celebration, you can get a 1 Year membership right now for only $49.99 (normally a $99.99 fee). We will be adding more pages between now and the next newsletter you receive. Look for updates there as well. Thanks again for your "subscribership". We certainly appreciate you as a member.